I did it! I have successful canned a condensed soup like Campbell's tomato soup. 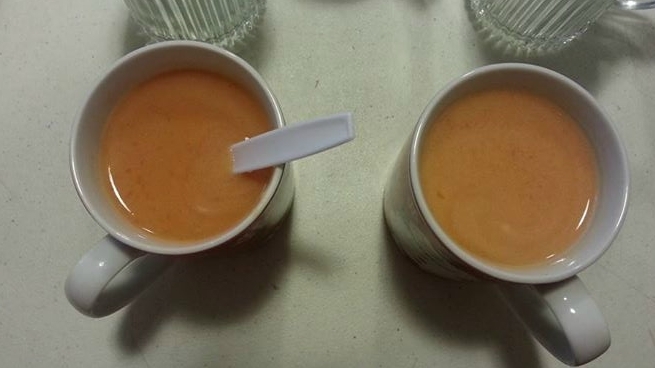 I am a big fan of tomato soup, especially the store bought canned soup that you add milk to and can drink from a mug. Last year I canned some tomato soup but it was not the consistency I was looking for. It tastes fine, but did not 'hit the spot' for that store bought mark I was looking for. I know, it's weird, I have all these lovely home-grown tomatoes and I am striving to re-create a store bought product. But sometimes, there are just certain things we all crave. Last year I also dehydrated a lot of our tomatoes and turned them into tomato powder. I then used this powder to make tomato soup. This turns out to make a very good soup, but it makes a heartier more artisan style soup since my dried tomatoes, and hence the powder, contain the skins and seeds. So, while we enjoy this soup, it is not the comfort food I was looking for and it also is not a heat and serve variety as I have to reconstitute the tomato powder and then add all the other ingredients for the soup. This year I was once again dehydrating tomatoes, which were quite prolific in the gardens. But then when over a week of overcast skies meant we did not have the extra power to run the dehydrators and I had tomatoes stacking up in the refrigerator and then on the kitchen counters. I decided to research my soup idea again and give it one more try. I discovered one product and one technique that made all the difference. The product is Clear-Gel (not to be confused with Sure-Jell) and the technique is how you cut up your tomatoes. Tomatoes, onions and celery cooking down. First, what I learned about cutting up tomatoes. The tomato soup I canned last year has water separation in the jars. It is perfectly fine to use, but does not look pretty. I have learned that if you cut tomatoes and let them sit they will release an enzyme that causes water to be released from the tomatoes. To prevent this you need to heat the tomatoes quickly after cutting them. So, cut a couple cups of tomatoes, add them to your pot and get them cooking, then continue cutting your tomatoes in small batches and adding them to the pot in this manner. to created canned condensed soups. And a few words about Clear-Gel. First off, you will not find it in the grocery store. You will find Sure-Jell but the two products are NOT interchangeable. I ordered mine on Amazon. Clear-Gel is a modified cornstarch that is often used by professional bakers for making pie fillings. It is a thickener that remains clear, has no flavor and keeps the product smooth (no lumps). Also it comes in both a cooked and instant variety. For canning you always want to use the cooked type because the instant will become unstable when heated twice which is what happens when you prepare a recipe and then can it. mill to remove the seeds and skins for a smooth soup. 1. Wash tomatoes and core (remove stem). I used a mix of the six varieties I have in the gardens this year. 2. Quarter small tomatoes, for larger tomatoes cut the quarters in half for smaller chunks. Remember to do this in batches of about two cups at a time and throw them into the pot that is already on the heat. 3. Chop your onion and celery and add to the pot. I actually did this after the first batch of tomatoes to give the onions and celery a longer cooking time. 4. Once all the tomatoes, onions and celery are in the pot (my batch filled my maslin jam pan up to the 2 gallon mark) simmer for about 1 1/2 hours until the onion and celery are tender. mixture when adding the Clear-Gel into the soup. At this point my Clear-Gel had not arrived from Amazon yet so I put the soup in the fridge. 6. Prep pint jars for canning, place lids in simmering water and prep the pressure canner. 7. Add lemon juice and salt to soup. 8. Mix the Clear-Gel with the sugar. 9. Add about 2 cups of soup into the Clear-Gel/sugar mix and stir until smooth. 10. Pour the Clear-Gel mixture into the soup and stir well. The soup will not thicken at this point. 11. Ladle hot soup into jars, leaving 1 inch head space. My batch filled 16 pint jars. 12. Clean jar rims, add lids & rings and place in canner. 13. Can at 10 pounds pressure (adjust for altitude as needed) for 20 minutes. 14. When canner is ready to open, remove jars, rest for 24 hours, remove rings, label and store. I tried the soup as I was putting it into the jars and I was afraid it was going to be too sweet even though I had used only half the sugar called for in most of the recipes I found. Then I remember that this was a condensed version so it would probably be okay that it was sweeter straight from the jar. When I opened the canner at the end of processing I saw I had quite a bit if cook-over, well maybe a half a teaspoon out of several jars which I consider a lot when I had left a 1-inch head space. When I had poured the soup into the jars it was still thin, the Clear-Gel does not thicken immediately, but when I took the jars out of the canner it was somewhat thickened and that may have caused the cook-over. However, all the jars sealed, I just had a bit of clean-up on most of the jars when I removed the rings. I used less of the Clear-Gel than is recommended because I did not want it to be too thick. I am not sure if a thicker product would lead to more or less cook-over from the boiling action. Next time I may experiment with a little more thickener but we really liked this end product with the amount used. I took a couple jars to the next meeting of our self-reliance group as my show-and-tell. This was a brave move because I hadn't tried the finished product yet. As the soup was not too thick, I mixed one jar of soup with a half jar of milk. I was a bit worried because it looked a bit light in color after the milk was added and I thought it might not be flavorful. However, everyone agreed that it was very good - there was plenty of flavor (just no red food color to enhance the appearance). This is definitely a keeper and worth some hot summertime canning in the kitchen to enjoy the warmth of comforting tomato soup on a cold winter night. That's what Hammy's soup is,Mmmm mmmm Good!